While some of them make sense, like can they ‘write their name?’ or ‘cut with scissors correctly? ', point four has left him shaking his head. ‘Can he or she identify 30+ letters?’ asks the list. 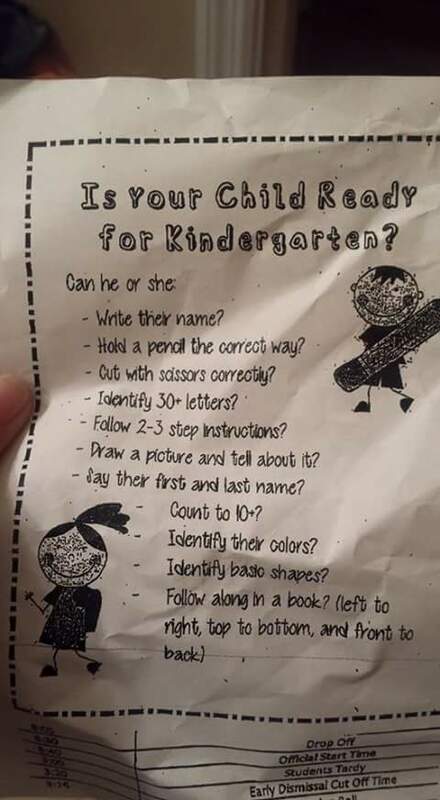 Posting the note to Reddit the bemused father says ‘I have failed my son for kindergarten!’ joking about there only being 26 letters in the alphabet to begin with. The letter has prompted a debate about how much pressure is put on kids to succeed younger and younger. ‘My son's school expected him to be able to read fluently by the end of Kindergarten,’ commented one Redditer. Teachers jumped in on the debate, saying that when kids arrive they can be at very different levels to each other. Some can read, while others can’t recognise their own name. ‘I would rather a child be potty trained, know how to tie shoes, zip zippers and button buttons,’ wrote one commenter.